This is the beautiful view we have from a living room window for a few days each spring. This morning, THE STONE RABBIT decided he wanted to hop up in the treee and snip a few of the blooms before they were totally ready to leave the tree. he FELL OUT OF THE TREE and BROKE off one of his precious ears!!!! However, being the strong bunny he is, he reassured me that a little glue will make him good as new. I'm still sick about it. He's been with me for way over thirty years. . . perfectly fine until today. I know one thing that will perk me (and YOU) up and that's visiting Beverly's blog HOW SWEET THE SHOUND. There will be a long list of other bloggers who have PINKS and springy thingies to share with you this week! We've always enjoyed celebrating each other's BIG day. . .and this year is no exception!! We can't do it today, but we have a day lined up in the very near future!! In the mean time, I'm sending her my best wishes for a super duper birthday. . .
and so are these sweet ones!! and of course, THE STONE RABBIT! Now I'm joining the many other bloggers you will find at Beverly's blog, HOW SWEET THE SOUND! We are sharing our PINKS or our Spring topics with you this weekend!! This is the "Spring wreath" I hung on our front porch last year. It is a pretty dark picture, but it was the only one I guess I took after looking back at the photos . Anyway, if you look closely, you can make out a bird's nest on the top, just to the right of the bow!! That bird took my "welcome' sign to heart! I took this picture from inside the house....through one of the little glass side panels on our front entry. It was a lot of fun to watch her build the nest, then to keep an eye on her as she sat on her eggs. The really sad thing is that she was spooked every time the front door opened and she flew off. After a while, she quit coming back, realizing the eggs weren't gonna hatch since she'd missed so much time keeping them warm. This year, I got the wreath out again. THE STONE RABBIT and I decided we'd add the old wood rabbit I'd found at a flea market a few years ago. I hung the wreath up. . .and guess what I spied perched on top of it a few minutes ago. . .yup. . a robin!!! Hope you find some fun things to do this weekend!!! Be sure to add visiting Beverly's blog to that list. At HOW SWEET THE SOUND you will find a long list of other bloggers who are ready to share a variety of topics that are Spring or Pink related!!! One of My Favorite Days of the Year!! I have to say that this coming Sunday marks one of my favorite days of the year....the beginning of DAYLIGHT SAVING TIME!!! I love those extended hours of light at the end of each day!!! THE STONE RABBIT thought you'd like to see the very last little spot of snow in our front yard!!! It will be gone in just a bit because WE ARE GONNA BE WARMING UP!! Yes!! The temps are "supposed" to be in the 50s from today right through the beginning of next week....AND I heard we may see 70s by next Wednesday!! I am so thrilled!!! Of course, in Missouri, we know all too well how this is most likely a brief respite. We've had doozies of ice storms and heavy snow accumulations in March. However, for the next few days we're gonna not even think about that. . .we're gonna get outside and breathe the fresh air and give thanks for this "heat wave"!! Please visit Beverly's blog HOW SWEET THE SOUND for a long list of other bloggers who have PINKS to share with you this week, too!!! Last year was the first time I'd ever watched the Boston Marathon . I'd started running in the summer of 2010. . .and didn't have an interest or a clue about "Boston" until last year!! I had a birthday luncheon to attend that day and, somehow, I found out I could "live stream" the elite runners. . .so while I was getting ready to go. ..I watched the marathon on my iPad!! I saw those elite runners finish. . .then I left. Later, after the luncheon, I got into my car to come home. . ..and turned on the radio. . .only to be stunned by the tragic and senseless events that had occurred at the finish line. This year, Twiggy Cat and I were determined to support those who had lost their lives or were injured in last year's attack AND the 2014 runners and BOSTON, by watching the marathon. And like so many others, we held our breath and prayed that all would be well. . .
On Tuesday, I to our nearby Bass Pro Trail. I have been dealing with an "injury" for two months. . . an outta the blue injury that knocked me on my running backside! And FYI, it had nothing to do with "running", but a raging case of tendinitis that was triggered by a calcium deposit in a muscle in my leg. I have been slowly trying to build up from just being able to walk longer and longer distances without pain . . . then , to running a few steps (and stopping when the pain started), and to my present level of being able to do run/walk intervals of 3 min./one min. for 3.1 miles!! It's been a miserable two months in terms of pain and worry (didn't know for awhile what was going on), but I'm feeling better that I can run without leg hurting. This was such an odd thing to happen . . . but probably was a reaction to an injury I'd received in that part of my leg years and years ago. I shouldn't be surprised. . .if it's gonna be something with a "slim chance of happening", well, it most likely will come my way!! Anyway, I'm going to do my first 5K of 2014 this weekend, so I headed to the trail for a 3 mile run/walk. It was a coolish and gorgeous morning to be out and about. Here's a little view of part of the lake on the South side of the trail. . .
And on the other side, they are building a motel. It was supposed to have been started a long time ago, but we are glad it's a "go" now. The Bass Pro building is behind the motel in this photo. . .you can see a bit of it peeking out on the left of it. It will mean more jobs for our area. This was what was waiting for me on another part of the trail. . .a PINK stuffed critter perched in a tree!!! Oh, and another bit of PINKNESS. . our weeping crabapple tree before the big old rains hit yesterday. It's so pretty when it's covered with all of those PINK blooms!! They just don't stay on long enough! I didn't have a chance to get a "new" photo of THE STONE RABBIT before writing this post, so I am sharing one I took of him a few years ago. He was visiting my neighbor across the street that day and enjoying her amazing tulips!!! He's always loved Spring. . .and this is one of the reasons. . .those flowers are so beautiful!! Be sure you visit Beverly's blog, HOW SWEET THE SOUND, for a long list of others who are waiting to share their PINKS with you again this week!! I heard someone on the TV use the term SPRING-TER to describe this crazy weather we've been having here in Missouri. Early in the week we had wonderfully warm temps and our plants were looking so fine!!! Here's a picture of little Twiggy looking out a window in our living room. . . her view of the street blocked by all of the luscious PINK blooms on our weeping crabapple tree. Here's the pretty flowers on the vinca that's spreading in a front planter. One day I even opened the windows. . .and Twiggy spent hours hanging out in the window sill. . .watching birds and bumble bees. On Wednesday it was sunny and our temps were in the mid 80s, but but by late afternoon the clouds started coming in. And soon the 80s were gone. By Thursday afternoon the sleet arrived. . .followed by SNOW!!!! Here is my beautiful weeping crabapple this morning. . .not looking so pretty since most of the petals were blown off by the strong winds that pushed the wicked weather on us. What a disappointment to have this happen right now!!! We are all so ready for winter to be gone.. . . .we want and NEED a Spring!!! I feel more alive when my toes aren't frozen! I hope the Spring in your neck of the woods is much better than ours!! Please be sure you "hop" over to Beverly's blog, HOW SWEET THE SOUND! You will find a long list of bloggers who have PINKS to share with you this week! Thank you, Beverly, for keeping us up and running!! An event I always look forward to attending each Spring is the "Antiques on the Veranda Garden Sale" held at the Greenwood Antique Mall in Greenwood, MO!! This booth belongs to one of my favorite vendors. . .Claudia. I'm not sure why my eyes look like that, but Claudia looks great!! The next three pictures are also of her booth!! I love the burlap star covered skirt she added to this little table!! We had a great time shopping in the antique mall, too! How about this PINK guitar I spotted in one of the booths.....and it was in tune, too! I didn't impress my friends with my memory of a couple of cords. . .but they are a hard lot to impress at times! Serious antique shopping requires a delicious lunch. . .and we enjoyed that in the Greenwood Antique Mall Tea Room!!! Something else I look forward to each Spring are my neighbor's tulips!!! THE STONE RABBIT loves them, too. In fact, he spent the better part of the lovely day today just hopping from one little patch of these gorgeous flowers to the next!! I hope you're enjoying many of the great Spring happenings going on right now. If you head over to Beverly's blog, HOW SWEET THE SOUND, you will find a lot of other bloggers ready to share their PINKS with you this week!! Thank you, Beverly, for keeping our PINK SATURDAY event up and running!! A SPRINGTIME STROLL. . .with a touch of PINK! THE STONE RABBIT was so excited when he read about Beverly's PINK SATURDAY theme this week. . .. SPRINGINESS!!! Here he is. . . enjoying the gorgeous bouquet of daffodils our friend Patty gave to us!!! She knows they are one of my all time favorite flowers! 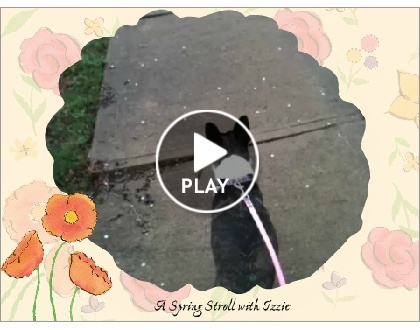 In keeping with our SPRING PINK SATURDAY theme this week, Izzie and I made a little video for you. . . and after you watch that, please go over to Beverly's blog, HOW SWEET THE SOUND, to see the long list of other bloggers who are sharing their special Spring and/or items of PINK with you this weekend!! !